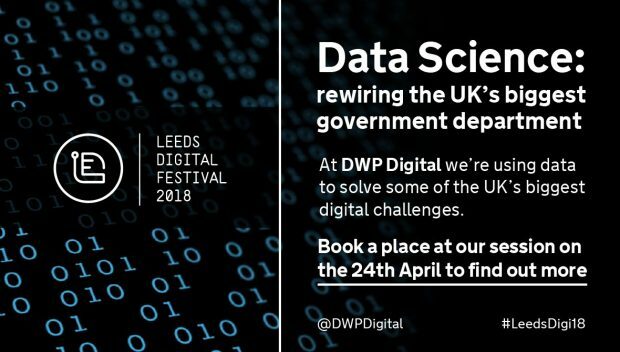 We’re really excited to be hosting a session at this year’s Leeds Digital festival, focusing on how we’re using cutting-edge data tools and techniques to transform digital services at DWP. The free event will take place on Tuesday 24 April at Duke Studios in Leeds, and offers attendees the opportunity to find out more about some of the innovative ways we’re using data to solve some of the country’s biggest digital challenges. You can register for tickets on our Eventbrite page. The digital sector in Yorkshire has grown massively in the last few years, so the two-week festival is sure to be an exciting celebration of all things digital in the region. With digital hubs in both Leeds and Sheffield (where we’re based), DWP Digital is right at the heart of the action. One of the best things about working in data DWP Digital is the diversity of the people who we work with. We’re both originally from biological science academic backgrounds, but we also have colleagues who are physicists and from other academic backgrounds, as well as those who have followed a more deliberate career path into the role. We’ve found that we can use the skills from our academic background – such as data wrangling and influencing – in a new way; communicating to a new group of people who want to use data to drive their design but need help and understanding when and how this data can be used. It’s been a fairly easy switch, and one that we’d definitely encourage other people from backgrounds like ours to consider. The session will start with a series of tech talks from members of our Data & Analytics community. You’ll also get the chance to ask questions and try out some of our data products. Following the tech talks, there’ll be an opportunity for networking and to find out more about the careers available at DWP Digital. We’re looking to recruit hundreds of specialists across the whole range of digital roles to our hubs in Leeds and Sheffield over the next year or so. If you’re interested in coming along, make sure you register for tickets on our Eventbrite page. Places are limited, so make sure you act quickly. In the meantime if you’ve got any questions, please get in touch. Using social media to communicate with customers, whatever the weather!